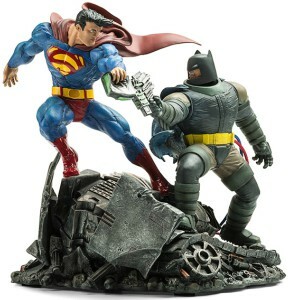 When Batman and Superman fight it is like a battle of the worlds finest and that is what you can see on this water bottle. This aluminium water bottle is 100% BPA free and is available in many colors besides the white one we show you above. On the bottle you can see Superman and Batman standing next to each other and between them you find the text “Battle Of The Worlds Finest” and below all that the Batman V Superman logo. This metal water bottle is great for work, school, workout or just when ever and it is available in 3 sizes so that you can choose the bottle you want. This magnet is all about Batman V Superman Dawn Of Justice. It shows Wonder Woman, Superman and of course Batman agains a dark background and the superhero’s don’t look like friends. 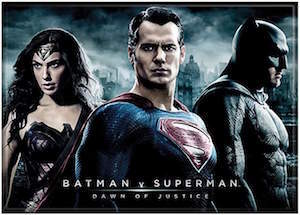 The Batman VS Superman magnet 2.5 x 3.5 inch and just looks like something that would look amazing on the fridge or maybe you locket at work or school. Any metal object could use some amazing superhero’s and having 3 is a great start. Magnets are always great to have and this one is special and would look great with you collection of Batman, Superman or Wonder Woman. This bifold wallet is all about Batman and Superman and on this wallet it looks like they are not friends. 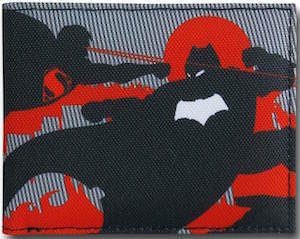 The whole outside of the wallet shows a battle between Batman and Superman just like you can see in that movie Batman VS Superman Dawn of Justice. A wallet like this of course is for the real men out there that want to show the world they like superhero’s and are not afraid to show it. The wallet has a grey and black striped background on witch you can see the battle in black and red. 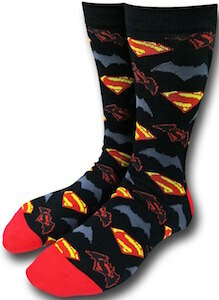 These crew socks for men are all about the battle between Batman and Superman. The socks are back with a red toe box but on that black fabric you can find the logo’s from Batman and Superman and even the logo from the movie Batman VS Superman Dawn Of Justice. Socks like this are not you boring plain socks you wear everyday but something more fun and something that makes you feel like you have super powers yourself. These superhero socks fit men’s sizes 6 – 12 but of course ladies are allowed to wear them to.